A startup founded by a decorated military veteran took home the top prize Wednesday (Dec. 2) in a UC-wide competition aimed at giving a boost to some of the university’s most promising life-science startups. Spinal Singularity, the startup founded by Derek Herrera, recent graduate of UCLA’s Anderson School of Management MBA program, won $150,000 in seed funding to develop and market a smart catheter that could vastly improve the lives of people with paralysis and others who suffer from neurogenic bladder dysfunction. Three other early-stage startups, representing UC Irvine, UC Berkeley and UCLA, each received $50,000 as runners up in the tough competition, which was open to early-stage life-science startups from across the UC system. The event, part of UC President Janet Napolitano’s Innovation and Entrepreneurship initiative, is one of the ways that UC is working to help its budding entrepreneurs launch successful companies. Across the University of California system there’s no shortage of budding entrepreneurs with groundbreaking ideas, but finding seed funding to help them grow their companies and create jobs can be challenging. An electrochemical biosensor developed by primeUC finalist Biolinq. “The primeUC program aims to offer these companies an opportunity to win significant seed funding as well as gain exposure to outside investors," said Neena Kadaba, director of the primeUC program. "The over 50 judges at Wednesday’s final event were potential angel investors, venture capitalists and corporate partners for our finalists, and we hope these connections will lead to greater opportunities for these young companies." PrimeUC was hosted by QB3, the University of California research institute and life-science accelerator headquartered at UCSF Mission Bay, and the prize money was provided by Johnson & Johnson Innovation. The competition focused on companies with early-stage innovations related to therapeutics, consumer health, medical devices and diagnostics. It is hoped that this will be the first of several such competitions designed to help the most promising UC-associated startups in different fields obtain seed funding. The four winners emerged from a field of more than 260 competitors, with 20 finalists invited to make pitches to a panel of judges at UC San Francisco’s Mission Bay campus Wednesday. Judges were looking for startups that are trying to addresses an important unmet need in an innovative way, have minimized risks, and have a clear path to commercializing their innovations. After a full day of in-depth pitches to the judges, all 20 finalists presented quick pitches during a public event before the judges awarded Herrera’s startup the grand prize of $150,000. Spinal Singularity's goal is to revolutionize the way people manage neurogenic bladder dysfunction with its Connected Catheter product, a first-of-its-kind smart catheter that alerts patients when their bladder is full via their mobile phone and allows them to empty their bladder with an internal valve. For Herrera, who is both founder and CEO, the company’s innovations are more than a business opportunity. Herrera was shot in the spine by an enemy fighter while leading his team on patrol in Afghanistan’s Helmand Valley and was instantly paralyzed from the waist down. 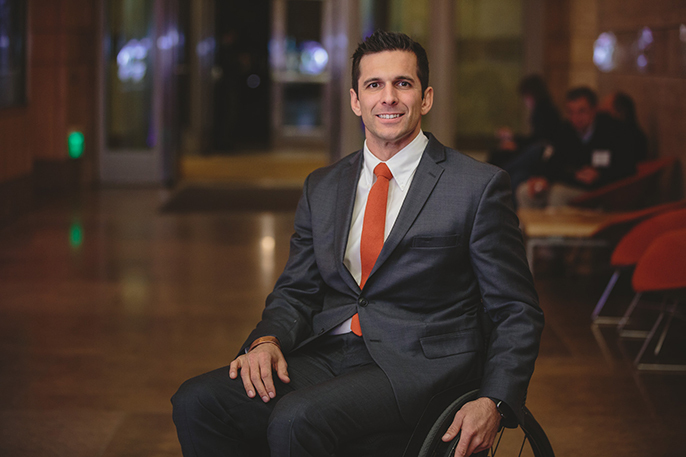 “What I learned after being paralyzed was that walking or mobility was not the primary issue for a lot of people who suffer from paralysis,” said Herrera, noting that sexual function, bladder and bowel function, and trunk stability are often bigger concerns. Today, Herrera is one of millions of people worldwide that uses a catheter several times a day to empty his bladder; Spinal Singularity’s product aims to vastly improve the quality of life for catheter users. Rounding out the runners up were: SonoMotion, a startup that is developing less invasive and more effective solutions for treating kidney stones; FirstStep Medical Technologies, makers of an in-home monitoring system for improving the lives of asthmatic children; and Laser Associated Sciences, a medical device startup that is developing tools to help diagnose, treat and monitor patients with vascular diseases. In addition to seed funding, the winners receive free legal assistance from the UC Hastings Startup Legal Garage. From the initial 263 applications submitted from all 10 campuses and two associated national laboratories, the field was winnowed down to the 20 most promising UC-affiliated startups, representing a strikingly broad array of innovative life science technologies from smart earplugs to cutting-edge baby monitors to targeted therapeutics. Trends included novel uses of remote and wearable sensor technology, microbiome-focused therapeutics and mobile integrations.